Renewable energy comes from the sun (solar, wind, hydraulic, biomass), the earth (geothermal heat) and the moon (tides). Fossil energies are the one we daily use but they are limited and polluting. Furthermore, renewable energy is endless. It respects the environment and is compatible with a sustainable development. 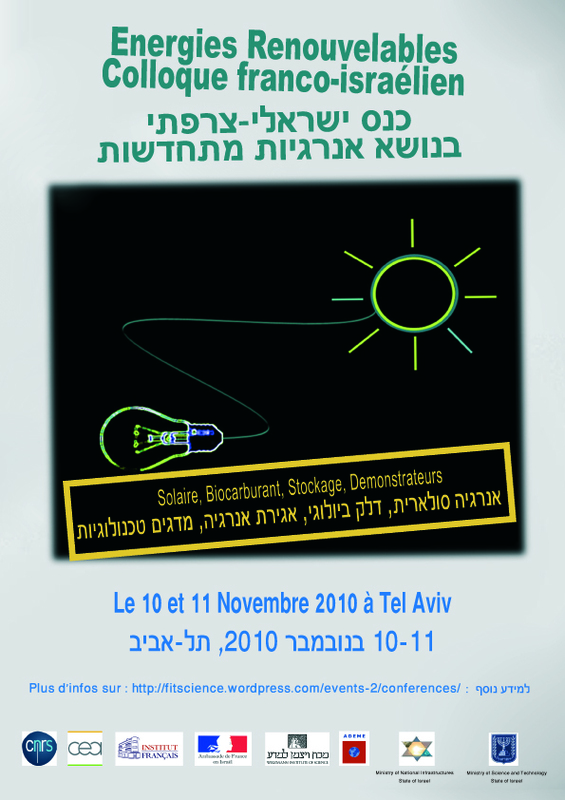 The Scientific Office of the French Embassy organizes the first French-Israeli Conference on Renewable Energy in partnership with the Israeli Ministry of Science and Technology (MOST), the Israeli Ministry of National Infrastructure, the ADEME (The French Environment and Energy Management Agency), the CNRS and the Weizmann Institute. This meeting will gather French and Israeli researchers on the topics of photovoltaic and thermal solar, biofuel and energy storage. One of the six projects of the Mediterranean Union is the Mediterranean Solar Plan whose goal is to develop renewable energies in the Mediterranean area with a focus on solar energy. Both countries will benefit from synergies in the field of renewable energies.